A simple and easy-to-use raygui styles editor. Hey Joel! Did you mind tagging the game in the Meatadata section as made with raylib? I think it is the first game in itch.io I'm aware of that's made with raylib! Oh! Ok, thank you! I think there are some games on itch.io... I'll take a look! Yes, I tried, actually I picked the image I would like to be used for the DevLog card but it seems it picks automatically one image I added to the post description instead of the attached one. Probably you will question, what is that good in comparison to other game libraries or engines? Simplicity but coding! raylib is extremely simple with an intuitive and clear API to let you enjoy coding, even if you start learning now or you return home from high-level bloated complex programming languages. But despite it apparent simplicity, raylib is a powerful framework to create graphic applications for multiple platforms... with NO external dependencies requirements! Sounds too good? Give it a try! Lately I post a new Devlog for raylib but I can't choose the image used to promote the Devlog. Is there any way to choose that image manually or it's assigned automatically? I didn't find a way to change it. 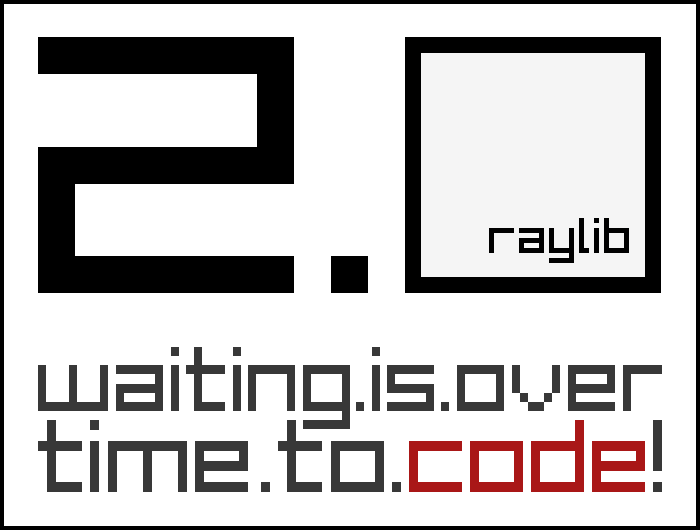 raylib 2.0 is already available on GitHub master branch but I expect to have the installer ready by the end of July as late. not yet, sorry. I started working on some network functionality, UDP only, based on socket... but it won't get into 2.0. Thanks for trying raylib! Hope you enjoy it! raylib v1.8 is a bit outdated (6 months old) but I'm about to publish raylib 2.0 with lots of improvements! I'm always open to questions and ready to help, in www.raylib.com top-right corner there is a bunch of network options to connect and ask for help, lately the most active one for quick questions is Discord server but for more elaborated questions I personally prefer raylib forum. You can also write me directly to ray[at]raylib.com if required. A simple and easy-to-use tool to generate sounds for your games, based on the amazing sfxr.